Cefalù is notable for beautiful sunsets, unpretentious charm, and a very appealing blend of ingredients for an Italian seaside holiday. Sandy beaches, a picturesque historic town on a rocky headland, some high culture in the shape of a fine Norman cathedral, decent transport links, Sicilian food and sunshine all add up to make the town one of Italy's most attractive seaside destinations. Unlike the modern beach resorts and developed fishing villages which dot Italy's coast, Cefalù has some grandeur in its past - it was important enough that one of Sicily's Norman rulers, Roger II, would build a glorious cathedral here. While its later history was less distinguished, there are some substantial and elegant buildings in the town, as well as reminders of Sicily's varied influences, not just Norman and Byzantine, but also Arab, Spanish and finally Italian. Nowadays tourism is a big and profitable industry here, and the modern town spreads out along the coast from the centro storico (historic centre). 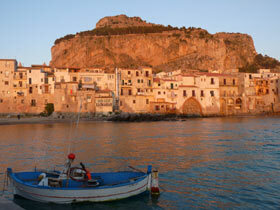 Cefalù is pronounced chef-a-loo, with the stress on the accented last syllable. 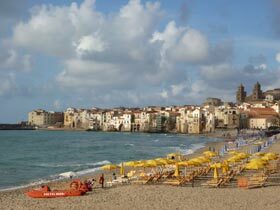 One of Cefalù's prime magnets for tourists is the sandy beach stretching alongside the town. It is very inviting, though visitors should be prepared to find the sands busy in the peak summer months of July and August, and partially occupied by fee-charging beach establishments. Set in the medieval district, Cefalù's other great tourist attraction is the town's Duomo, a handsome and imposing two-towered Norman cathedral. Begun in 1131, this mighty church dominates the rooftops of the centro storico. The building's interior is decorated with lovely mosaics created by twelfth-century Byzantine artists: a large Christ Pantocrator on a gold background dominating the apse, above the Madonna, archangels and Apostles. These gleaming mosaics are one of Sicily's greatest sights; if you want more, take a trip to Monreale, outside Palermo. Alongside the church is its restored twelfth-century cloister (admission fee), which is an atmospheric space lined with double columns topped by curious capitals depicting an odd range of scenes, from Noah's ark to strange contortionists. Towering above the Duomo and the town centre is the massive crag called the Rocca. It's a steep ascent to the top of the hill (take a bottle of water and don't attempt the climb in very hot weather) but it's well worth the effort. Near the top you'll reach the evocative ruins of the so-called 'Tempio di Diana' (temple of Diana), an ancient megalithic stone structure which was given a modernisation in the 5th-century BC in the classical Greek style. Around the summit of the Rocca are superb views and various bits of old fortifications, including a stretch of (reconstructed) battlements. Back in town visitors can admire the picturesque harbour, alleys and medieval buildings. A Saracen wash-house, the Lavatoio, is another sight worth seeing, as is the medieval Osterio Magno, the remaining part of a large 13th-century palace. A rocky path winds along the shore below the city's seafacing walls, and it is quite an adventure to clamber along and explore. 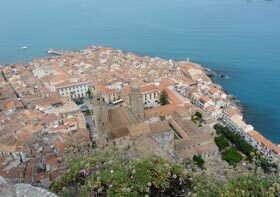 An important stop on any cultural itinerary is Cefalù's town museum, the Museo Mandralisca. The collection is neither huge nor demanding, but it includes several gems, including a portrait by Antonello da Messina and a striking vase from the fourth century BC decorated with a fishmonger chopping a tuna fish; a sight you may well see today in Sicily's fish markets. The museum's latest opening hours and admission fee are listed on the official website (see links panel). Around Cefalù, places of interest include the Sanctuary of Gibilmanna, a hillside pilgrimage destination, the ruins of Greek Himera and the Monti Madonie mountains, where holiday-makers will find skiing in winter and good hiking in spring and autumn. Palermo is an hour away by train, and the volcanic Aeolian Islands can be reached by hydrofoil in the summer. A trip by bus or car to picturesque Castelbuono, in the hills, makes another pleasant excursion - buses operated by SAIS depart from Cefalù railway station and the journey takes 40 minutes. Local tourism agencies organise tours and excursions. 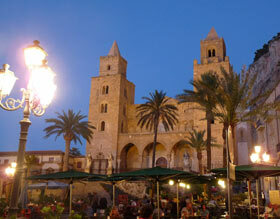 Cefalù is within reach of the international airport at Palermo, which is served by direct budget flights from the UK. The two towns are connected by the Autostrada 20 and also by a railway line (with trains approximately hourly). Urban buses provide transport within Cefalù, and more bus services link the town with surrounding towns and villages. The railway station is in walking distance of the historic centre and beaches - to reach the Duomo, head right outside the station until you reach Via Matteotti, turn left and then just walk straight down this street, which turns into Corso Ruggero, the main artery of the centro storico. It's not a good idea to try driving right into the heart of Cefalù - if you are taking a car to a central hotel or B&B, contact them first to ask for directions and parking information. We arrived in Cefalù by train from Agrigento (under three hours, with a change at Termini Imerese), and moved on to Palermo. In the summer, when there is a hydrofoil service operated by Ustica Lines, you could combine the town with the Aeolian Islands for a relaxing beaches-and-islands holiday. We stayed in the B&B Dolce Vita, a decent though fairly basic bed and breakfast in a breathtaking location on the seashore just down the road from the Duomo. The B&B's communal terrace overlooking the sea is a lovely place to sit and enjoy a DIY lunch (rolls available from a general store over the road) and a glass of wine. For breakfast we were given vouchers for a cafe in front of the Duomo, where we enjoyed warm chocolate-oozing croissants. > The four-star Artemis Hotel, a conveniently-located modern hotel, close to the beach and railway station, with a car park. > Astro Suite Hotel, a comfortable all-suites hotel with an outdoor swimming pool and private beach. > Hotel Kalura, a popular seafront three-star a short distance outside town. > Palazzo Maria - apartments with balconies in a historic building in the heart of the old town - some rooms actually face the Duomo. > B&B Bohemien a B&B with artist-themed rooms, near the Rocca. 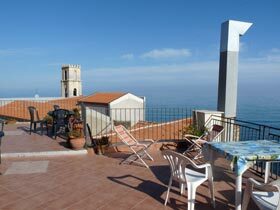 There's a fairly good choice of accommodation in Cefalù, ranging from town-centre B&Bs to modern seaside hotels, as well as some attractive rural options outside town, which might appeal to travellers with a car.